Redemption – a running ghost is exorcised. One of my aims for last year was to run a sub 1.50 half marathon. Full of confidence, in June ’13 I enlisted the help of my daughter and amazing ultra runner Cat, who at the time of writing this is undertaking The Atacama Crossing. She happily agreed to pace me at the Up Flow Down Tow, even though it meant a rather pedestrian run for her. Well I failed. Other halves came and went, running 2 with a stress fracture in my foot didn’t help, starting at the back of the Paddock Wood thus having to weave in and out for a few km was a mistake and it was never going to happen at this year’s Kent Coastal as Cat was running with a 6.5 kg backpack (having run 28 miles on the previous day with the same) for Atacama training, and we ran together to support her. So the Brussels half came around; I should have run it last year but I was in the middle of stress fracture recovery so couldn’t. The organisers happily deferred the entry until this year and the thought of a ‘free’ run was too good to miss. So as to make the whole package as cheap as possible (I did still travel over last year as I had booked and paid for transport and accommodation prior to the injury) I took the mode of transport from London to Brussels guaranteed to provide the worst possible race preparation, the Saturday overnight coach at £17.50 – and the same coming back on Sunday night.) You won’t be surprised to hear I didn’t get much sleep. Arriving just after 6.00am with 4½ hours before the start I made my way to the Holiday Inn. I had asked the race organisers if they could recommend where I could get my gluten free porridge prepared and this is where they suggested as it was the official race hotel; the first thing I saw there were the 3 Kenyan runners who were expected to be the ones to beat having breakfast! The chef couldn’t have been more helpful, besides happily microwaving my porridge he told me to help myself to anything else that I wanted. Thank you Holiday Inn. I eventually went to collect my bib, and to see what I could do about getting the technical top I’d paid for and collected last year swapped for the 2014 edition. They were very accommodating giving me one of this year’s (no €15 charge) and let me keep last year’s. I found a few Brits to talk to; their major topic seemed to be about the undulating nature of the course, Brussels does have an unexpectedly hilly profile. Not me, just the balloons! 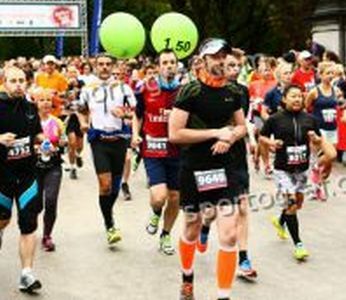 I had decided to do what was successful for me in the Düsseldorf marathon and run with the 4 hour pacer and as there was a 1.50 it seemed ideal. Running conditions were excellent, then had been some light rain and it was cool without sun or wind. The start was quite bizarre, the actually timing pads were a few 100m on from the inflatable start gate and we were into full stride by the time we reached them. But not a bad thing. Everything went to plan for the first half of the race, the running was comfortable and I’m sure the 2 pacers and their green balloons were working well together keeping the group of 20 or so on what was needed. But as in Düsseldorf I lost them after a water station; I had changed from running just behind the balloons to running just in front and didn’t realise that I had slightly increased my pace (or the pacers had slowed!). The hills/undulations didn’t concern me, I have been purposely running up 2 local long hills at least twice a week so maybe that is working. As the kilometres ticked by my previous companions were noway to be seen and I was regularly overtaking runners. Still resisting the temptation to look at my gps, at the 20k marker a big timer was visible and I was a bit shocked, knowing that it was gun time and I wasn’t sure how many minutes after that I had crossed the start pad, I felt I must up my pace. The rest of the race was downhill or flat, although quite a lot of wet cobbles. Looking at my gps details now I averaged fractionally 15 km/h or 4 min/km over the last 1.1k. And it worked, the had timer showed me that the 1.50 was beat but at the finish line so was 1.45 was finishing in 1.44.26 giving me (what I consider to be) a massive 9m 10s PB. Absolute euphoria at the end I had never considered a sub 1.45 was ever likely, the thought of running at an average of more than 12 km/h over the distance never crossed my mind. It gave me an age graded time of 1:20:32 and age graded % of 73.53. It was my 2nd PB in just over a week, I broke my parkrun with 22.40 the previous weekend. As I also PBed in my last marathon in Guernsey at the end of August I am feel quite smug. Overall I ended 1770 out of 7316 runners and 7/37 in my M65 category. So thank you Brussels, because of you I have well and truly laid the 1.50 ghost. My only complaint about the city is the beer…there is just too much choice. Despite having almost 12 hours after the finish before boarding the coach back I couldn’t even scratch the surface of the huge range in the amazing Délirium Café which I stumbled across. 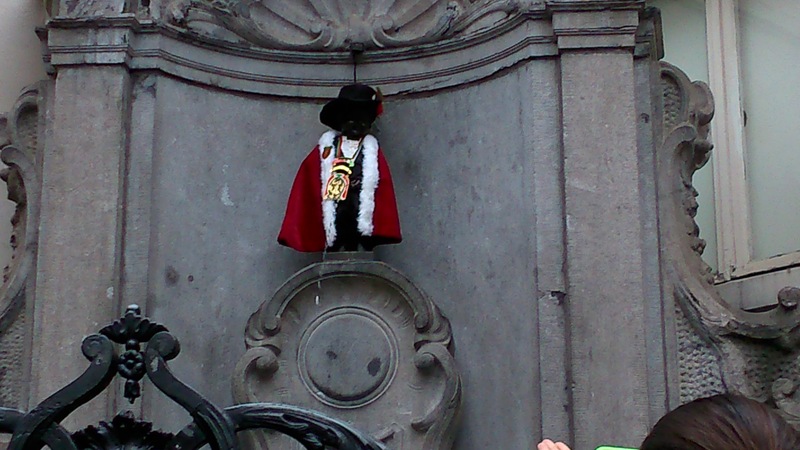 The Manneken Pis was specially dressed for the day. DNS. Common sense prevails , at last. 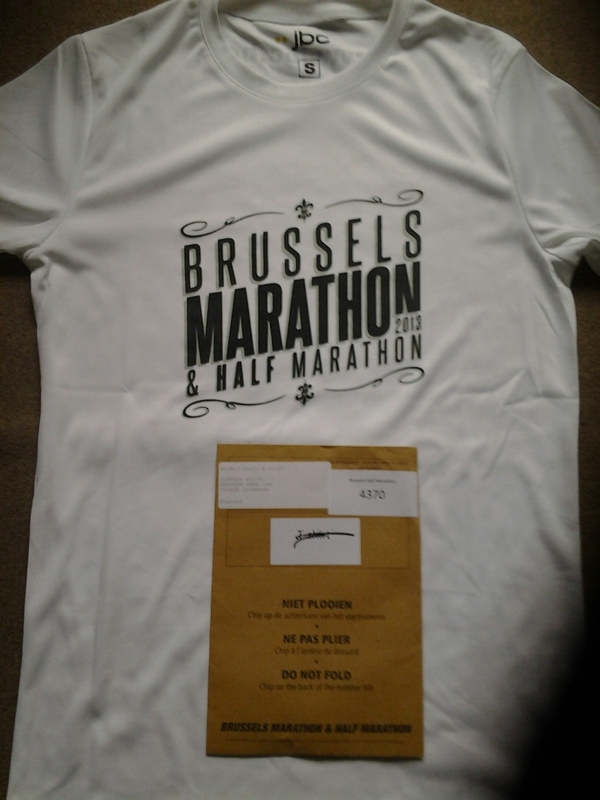 I entered the Brussels half marathon 6 months ago, bought my Eurostar tickets and booked a room for the Saturday night. Before each of the last 2 half marathons I ran, 4 and 5 weeks ago, I had considered not starting because of my foot injury. Maybe I made the wrong decisions then, because I ran both of them. But not this time. I did collect my bib with its chip, and it is still sealed in the envelope. I had paid for the technical T so I also collected it, but of course now have a dilemma. How can I justify wearing it? 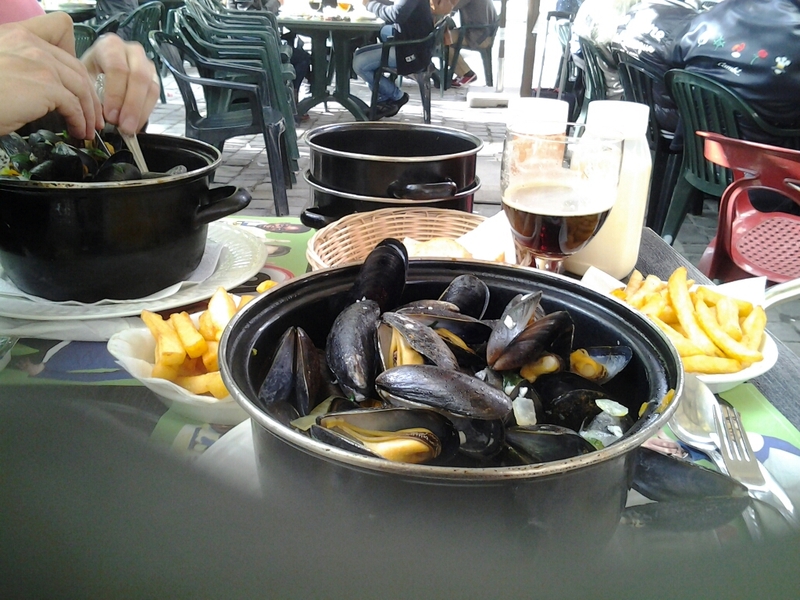 I ended up watching my son in law run his 85th marathon, chasing him around Brussels on the metro and trams, eating mussels and drinking a few of the local beers. I actually walked for more time, and a greater distance, than I have in total over the past 4 weeks. I am sure that if I hadn’t an even more important race coming up I would have forced myself round. But I do have to do a marathon before the year is out, and I am entered for 2. I think I may well be sensible again, and decide to do the 2nd, Athens (in 5 weeks) rather then Amsterdam in 2 weeks.